The Receiver of the Common Treasure - the Minister of Finance - directs the administration of the finances and the property of the Order in coordination with the Grand Chancellor, under the authority of the Grand Master and the surveillance of the Board of Auditors. He is responsible for drawing up the annual accounts, relating to the economic and financial state of the Order, submitting them to the Board of Auditors and to the Grand Master, with the advice of the Sovereign Council, for approval. Also with the advice of the Sovereign Council, he submits to the Grand Master for approval the acceptance of inheritances, bequests and donations, and the disposal and subsequent reinvestment of the goods of the Order. He manages and supervises the Magistral Postal Service and, through the Secretary General , the internal services of the Magistral household, the Personnel Office of the Grand Magistry, the Office of Technical Services and the superintendence of the Magistral Palace and related buildings. With the mandate of the Grand Master, the Receiver also supervises the administration of the organisations and works of the Order. He is the counter-signatory for acts of disposal or assignment and contracts which involve the property of the Grand Magistry and the Priories. Born on May 21st 1951 in Ering am Inn, Germany, János Esterházy de Galántha is married and has two children. He is a graduate of the Golden Gate University School of International Management, San Francisco, (M.B.A.), the University of Virginia, School of Law, (LL.M.) and the Ludwig-Maximilians-University of Munich, Faculty of Law, where he was admitted to the German Bar. He was educated at the Jesuit College St. Blasien. 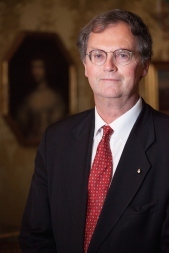 He was a Board Member of the German-American Chamber of Commerce (AmCham Germany) from 1994 to 2003 and is a founding board member of the Carl Friedrich von Weizsäcker-Gesellschaft in Switzerland. From 1985 to 2011, he worked in a multinational U.S Fortune 50 Corporation in various management functions. Since 2012, he is a partner in an international law and consultant firm with offices in Germany and Switzerland.